I don't know if this is worth starting a thread about but as I was channel surfing I briefly paused on the new HBO series Big Little Lies and as a family is eating breakfast King Kong starts playing prominently as it transitions to another scene. 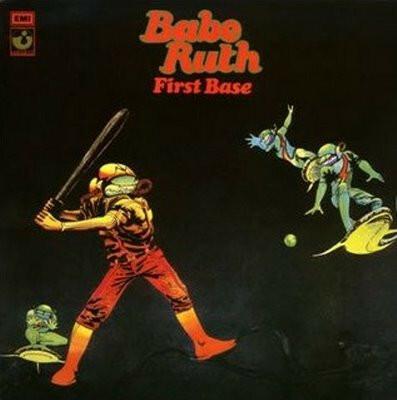 Babe Ruth was a five-piece rock band formed in 1971 out of a group called Shacklock (named after their songwriter/guitarist Alan Shacklock) in Hatfield, England, and they recorded this, their debut LP, the following year at EMI's Abbey Road studios. Alongside interesting covers of Jesse Winchester ('Black Dog') and Frank Zappa ('King Kong'), the record's opening song 'Wells Fargo' displays the band's recurring obsession with using Hispanic/western themes in their work. Another example of this and the stand-out track on the album is 'The Mexican' which begins with a delicate Spanish guitar intro and then has original Babe Ruth vocalist Jennie "Janita" Haan beltin' out lyrics about a soldier serving under Santa Anna (during the 1836 Texan Revolt) before culminating in a big guitar riff borrowing Ennio Morricone's theme to spaghetti-western 'For a Few Dollars More' (Babe Ruth went on to cover Morricone's 'A Fistful of Dollars' on their self-titled third album); crucially the song also has a solid drum and bassline backing throughout. Despite being by a British band, the 'First Base' LP proved to be most successful in Canada. Steve D'Acquisto heard the song during a visit to Montreal which led to it getting played at David Mancuso's legendary The Loft events in Manhattan where it became a firm favourite with party-goers, and yet the track had its most significant cultural impact in the Bronx during the birth of hiphop. In the early/mid 1970's in the Bronx the biggest dance parties were hosted by Kool DJ Herc, starting out in the rec-room at 1520 Sedgwick Avenue and later spilling out into the first outdoor block parties. Although his mighty Herculoids rig was also an important factor, Herc established his reputation by crate-digging in record stores so that he could play the most exclusive and obscure records that the radio stations (and other Bronx party deejays) didn't have - he even concealed the labels to keep them secret. Whilst playing he observed that many of the dancers (who he dubbed his "b-boys") would wait for the funky drums on the instrumental break of a record before going wild on the dancefloor and he struck upon the idea of extending the break by either juggling between two copies of the same song (notably looping James Brown's "clap yer hands, stomp yer feet" line from the album remix of 'Give it Up or Turnit a Loose') or mixing together several different "break" tracks. Herc named this part of his set the "merry-go-round", unaware that he'd simultaneously pioneered the concept of the "break-beat" and kickstarted the entire hiphop movement! ...and the link to Babe Ruth is that one of Kool Herc's favourite vinyl exclusives to play in the merry-go-round was 'The Mexican'. The track became a Bronx block party anthem and was a frequent influence when hiphop records started to get released in later years, for example seminal electro classic 'Planet Rock' rips the "Morricone bit" (around four minutes in) and 'Go to Work' by Kool D samples the guitar riff while 'Feel It (The Mexican)' by the Funky Four on Sugar Hill converts some of the guitar parts into trebly brass and squiggly synth riffs, copies the percussion and uses the same lyrical metre (but different words). Although it'll never be as big as the Apache break (another "discovery" credited to Herc), the distinctive bassy Mexican break was used on several old skool hiphop tracks such as 'Africa (Goin' Back Home)' by Doug E Fresh, 'Prisoners of War' by Organized Konfusion and 'On the Run' by the Jungle Brothers. All the original breaks tracks from the 70's are still just as popular today in the breakin' scene (although most of them were recorded by black American funk acts, not white British rock bands!) and Babe Ruth's contribution in particular is respected and revered as a classic. This explains why DJ Spitfire used the break and vocals throughout his intro tracks on the first 'Strictly B-Boy Breaks' compilation in 2000 and I've even seen footage of a breakin' competition where not only does the deejay play 'The Mexican' during the final b-boy battle but the event is actually named after one of the lyrics: "Chico Got To Have His Share". Elsewhere - outside the hiphop world - 'The Mexican' has inspired several cover versions: in 1978 the Bombers included a 12-minute disco work-out on their self-titled debut LP, in 1984 John "Jellybean" Benitez got Janita Haan on board for a freestyle interpretation that topped the Billboard dance chart and in 1999 German metallers Helloween recorded their take on the song for their compilation of covers entitled 'Metal Jukebox'. Another copycat track is the massive 1988 warehouse rave anthem 'Dreams of Santa Anna' by Orange Lemon (Todd Terry) which has a magical Morricone synth lead and a few sampled vocals (presumably taken from the acappella on the Jellybean 12"); Todd Terry's 'The Texican' and JD's 'Good Vibrations' from the same period also feature similar elements. In 1993 Sonia Papp sung the original vocals over a poppy (Pappy?) dance beat for her own 'The Mexican' single while Thalía borrowed the drum and guitar parts for her 2002 single 'Dance Dance (The Mexican)'. The song's historical significance and classic status is evidenced by its various appearances on (non-rock) compilations, for example the legendary Grandmaster Flash included it on his 'The Official Adventures...' compilation on Strut and it's one of several hiphop-sampled 70's breaks tracks used on the Prodigy's 1997 'Dirtchamber Sessions' mix album where Liam plays a long section of 'The Mexican' and even extends the instrumental break hiphop-style. It's also included on the Big Apple Productions old skool breaks megamix on the 'Ultimate Lessons 2' compilation, again with the break looped (which is no mean feat if mixed live on turntables as the basic guitar-free drum break is only four beats long). Obsessives (like me!) should also check-out Morricone's original whistled theme to Sergio Leone's 'For A Few Dollars More', the cover version of it by Material featuring scratches by Grandmixer D.St (available on the 1992 reissue of the 'Memory Serves' album) and the remix by Terranova with appropriately twangy spaghetti-western guitar and a funky breakbeat (on the 'Morricone Rmx' compilation). Also listen to 'The Good, The Bad and The Dread' by Dreadzone which samples the whistling from the Morricone original. In 2002 Hooch, the founder and promoter of the UK B-Boy Championships, successfully convinced the band to play at the event that year with a line-up including Alan Shacklock, Janita Haan and original keyboardist Dave Punshon. This lead directly to the band reforming and - a whole three decades after their previous LP - recording the album 'Qué Pasa' in 2006. This included a new version of the track entitled 'The Mexican Millennium', split into three parts with the central 'Santa Ana' portion rearranged slightly (but still using that classic Morricone riff) and with the drum break replacing the original beatless intro, presumably to make it more deejay-friendly. In the same year 'The Mexican' was included as one of the unlockable songs on the (BAFTA Video Games Awards nominated) soundtrack to the Sony PS2/PSP video-game B-Boy. After its initial digital release, a physical issue of 'Qué Pasa' finally became available in 2009 with several nods to the band's hiphop legacy on the artwork including shouts to Hooch ("if it wasn't 4 u! "), Crazy Legs, Herc and Flash, graffiti text and web addresses for both the UK B-Boy Champs and B-Boy game. In 2016 'The Mexican' featured in the fourth episode of the Netflix miniseries 'The Get Down' - a musical odyssey through the South Bronx in the late 70's. It's cool to see "The Founder" Kool Herc (portrayed by Eric D. Hill Jr.) dropping the track at an underground dance party. We only get a few precious seconds but the show makes up for it by reprising the song over the end credits of that episode.